England baroque fashion 1685. Reign of James II. Home » England baroque fashion 1685. Reign of James II. This plate represents a soft brocade gown which was brought from England to the Barbadoes Colony in 1685. It is looped back over a satin petticoat, originally white, but mellowed by time into a rich ivory tint, and trimmed with two flounces of lace. The sleeves of the low-cut bodice are short and finished with a fringed gimp of the prevailing soft red colour of the brocade. The stomacher is trimmed with graduated bows of ribbon in the fashion called “Echelles.” The under sleeves of fine lawn are finished with lace ruffles to correspond with the falling band or collar. 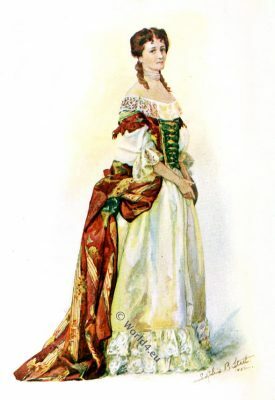 The skirt of the gown is quite long in the back and is looped at the hips with knots of ribbon ; it is laid in plaits around the waist and sewed to the bodice which is fitted close to the figure. At that period the hair was drawn back softly from the face and two curls hung down on the shoulders from the knot at the back. Source: Historic dress in America by Elisabeth McClellan. Publishers: George W. Jacobs & Company, Philadelphia. Costumes Louis XV era. Rococo fashion 1720-1740. This entry was posted in 1685, 17th Century, Baroque, England, Stuart and tagged Baroque fashion, Elisabeth McClellan on 11/24/16 by world4.